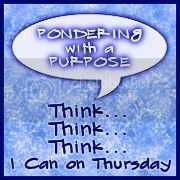 Thank you Brenda for hosting “Pondering with a purpose”. You certainly make us think! Today the topic is Overcoming Loss! I fear the Loss of Memory more than anything else. My dad suffers from Alzheimer’s and many of his family have succumbed to this dreadful disease. As a daughter watching from the sidelines it is difficult to see the changes in my Dad. We are very fortunate that he still has a sense of humour. The sad thing about this disease is that he can live in the past however he has no future. My Dad can’t keep up with all of the changes in the family. It is amazing however that he can remember everyone in his first class picture taken nearly 75 years ago. He still speaks many different languages (mostly bad words). He will ask us the same questions over and over because he can’t remember the answers. As the world changes my Dad gets left behind. We do our best to keep him informed with lots of pictures which he devours. We try to see him as often as possible which is hard since they are 4 and half hours away. Thankfully my mother is a Godsend. She does her very best to keep him happy and answers his never ending questions and continuous jokes. It is important to live life to the fullest and keep as many memories as possible. Don’t throw away those picture albums and try to learn as much as you can about your family while you can. Once your loved ones are gone there is no going back!